Our Taekwondo School in McKinney, TX is a professional full time martial arts program. 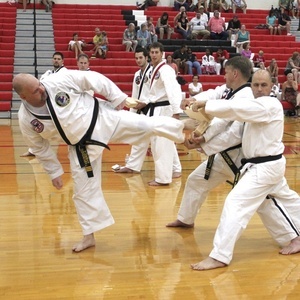 At Davis' you will learn traditional Taekwondo, aka Korean Karate from highly skilled, unique professionals with many years of experience. MARTIAL ARTS IS A FULL BODY WORKOUT. Besides being a powerful form of self-defense, the exercise you get from our martial arts program (aerobic / cardio, kickboxing, strength training, flexibility) benefits every part of the body, including how you feel about yourself. And you will have fun in a community of friendly instructors & students. Many adults come to our classes for various reasons. Some come to increase their physical activity, some come to develop confidence to tackle any challenges. Others come to learn self-defense skills. A lot of adults have wanted to take martial arts classes most of their lives, but just never got the motivation to start. Whatever your reason is for inquiring about our classes, we’re really glad YOU ARE HERE! 1. In the Business World - the indomitable spirit of the committed martial artist pays huge dividends. Strengthen your focus and perseverance for a huge competitive advantage. 2. As a Parent - modeling respect, self-discipline and thoughtful understanding will help your children develop these attributes. Through regular training, the mental benefits of the martial arts quickly become apparent as students notice improved focus and concentration, greater stress relief and management, improved confidence and an overall greater sense of well-being. Martial arts are about much more than punching and kicking, it is a holistic approach to physical fitness and improved mental health. - Take control of your mind, body and emotions. - Never be a victim, physically or emotionally. - Learn highly effective and powerful self-defense skills in a fun, friendly environment. By working out with purpose you will get in the best shape of your life. Our program is designed with the latest in exercise physiology and excellent cardiovascular conditioning. You will also experience a tremendous increase in energy and stamina. Our adult program is designed to challenge all levels of fitness without feeling overwhelming. Our instructors will help to tailor the exercises to work within your fitness ability. Classes are built on a structure of cardiovascular conditioning, muscular strength and toning and flexibility using traditional martial arts training as the foundation. Stretching in each class will allow you to maintain muscle and joint flexibility. When you stretch regularly, you will also reduce general muscle tension. It's a key to pain relief and healing from injury. Stretching and flexibility provides anti-aging benefits, too. FOR MORE INFORMATION CALL US AT 214-856-5885. Our Taekwondo Karate program for the very young children teaches discipline and paying attention. It is directed towards developing positive relationship to being active while also fun and engaging. Fun and exciting classes that teach your child confidence, self-defense, help them get in shape and most importantly... give them the tools they need for a happy, successful life. We have the ultimate way for your teenager to build confidence, self-esteem, develop self-discipline, self-control, and athletic skills, while having lots of fun through martial arts! You will get a great kickboxing and martial arts workout, burning calories while developing more focus, inner strength, discipline and learning powerful self-defense from a community of friendly instructors and students. Davis' Martial Arts is the leading Taekwondo Karate school in McKinney, TX. Since our opening we have been providing the finest martial arts, self-defense & fitness training for Children, Teens and Adults.